DataCom has implemented a carrier class network enabled for delivering L2 services such label switching, dot1q, qinq as well as standard L3 IP services. 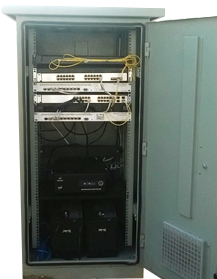 Built on a resilient platform of Cisco Metro equipment and other proven technologies, the DataCom network is aimed at servicing both our clients in Malawi as well as International resellers that require demanding service level targets. The network is designed with emphasis on performance, availability and security with extensive systems and policies for logging, monitoring and alerting. As an example of our careful network planning, most of our co-location sites are characterized by weather proof cabinets (shown below) that provide exclusive and unhindered access to our field technicians. The result of such a small innovation is that our network experiences less outages due to inadvertent handling and further more restoration times are reduced because our personnel have direct access to our equipment without need to consult our co-location hosts. Another innovation is that these cabinets have self-contained backup power that is able to drive our standard equipment loads for periods greater than 10 hours ensuring uninterrupted operation through most power outages even in the event of backup generator failure. It is due to the excellence and innovations of our implementation that our network has been classified as one of the most reliable by our upstream partners.